This type of teaching is most fundamental in ABA Therapy. Therapist and child work on learning smaller components of larger skills. Once smaller components are taught, they are chained together to create larger, more complex skills. Many times, this type of teaching occurs at a table or in a quiet area providing opportunities for focus and repetition. 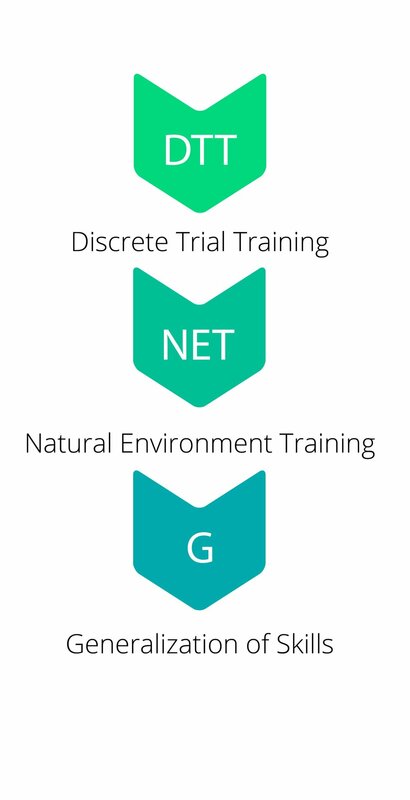 In Natural Environment Training, skills learned in DTT settings apply to the natural context. Depending on a child’s skill level, a combination of teaching methods, DTT and NET, can be used at the same time to achieve best treatment outcomes. This process teaches children to apply learned skills to other people and settings. This is an essential course of treatment. We find children with Autism often need assistance transferring and performing learned skills to caregivers and/ or the community. A Registered Behavior Technician (RBT) will provide 1-on-1 ABA Therapy to your child at your home, school, or community. A Board Certified Behavior Analyst (BCBA) will oversee treatment application by the RBT and work closely with you to ensure best results.